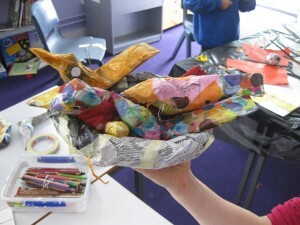 The children in my Friday art group at Singlegate Primary School have been making their papier mache birds – here’s a nestful, and there are many more. They are inventing names and personalities and stories for the birds, and will be making books about them for the school library. One is a sumo bird, and another wears tiny glasses. This entry was posted in recycling, Workshops on May 15, 2009 by Jane Porter. I’d love to see/read the books! What a great project.